eduroam (Education Roaming) is a location independent wireless network which allows members of participant institutions to use their unique credentials to gain access to wireless network at their home institution or at other member institutions. eduroam has a large number of members all over the world, mostly in Europe and Asia Pacific, including institutions in Hong Kong, Australia, United Kingdom, France and Germany etc. Since EdUHK is a member of eduroam, staff and students are eligible to access eduroam here at EdUHK as well as at other member institutions. The wireless infrastructure at EdUHK support IEEE 802.11 a/b/g standards. Data encryption is enforced for data transmission over the air to ensure data security using WPA. Members of participant institutions can connect to eduroam at EdUHK with any Wi-Fi devices (e.g. PDA, Notebook) that support these standards. For Android devices, please select the wireless SSID "eduroam". 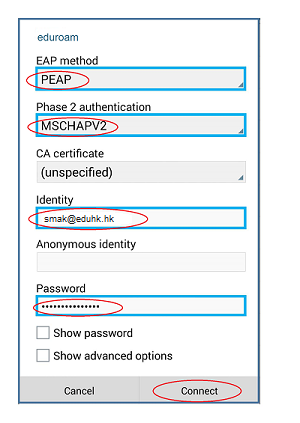 Then select "PEAP" for the EAP method and "MSCHAPV2" for the Phase 2 Authentication. Enter your EdUHK email address (e.g. username@eduhk.hk) for Identity and your network password for Password. The field Anonymous identity can be left blank. Lastly, click Connect. Detailed procedures on setting up other devices can be found at Wireless Network Connection for staff and students through WPA/WPA2. For any queries about using the service or if you need further assistance, please contact IT Help Desk at 2948 6601. Members of the EdUHK can connect to eduroam at any member institutions with their EdUHK email address (e.g. username@eduhk.hk). However, other settings may vary depending on different participant institutions. For details, please refer to the link provided by the corresponding participant.